Kettlebells are cannonball shaped equipments made of cast iron with a handle on top. This unusual shape of the tool leads to an uneven distribution of weight which makes it tougher to manoeuvre and control it. And it is this difficulty that makes kettlebell workouts so effective for burning fat and toning muscles all over the body. So if you are looking for a workout regime that will help your clients reduce that tough abdominal fat, kettlebells are just what you should use. Kettlebell courses teach you several movements using kettlebells that are specifically beneficial for toning and firming the abdominal region. If you have ever wondered what it takes to be an instructor, be sure to check out becoming an internationally accredited instructor where you can find the best kettlebell instructor qualifications. The Turkish get-up is one of the fundamental workouts taught at kettlebell courses. It is a full body workout that gives your abs a good workout especially while you sit up from the supine position. To do this, begin by lying on your back. 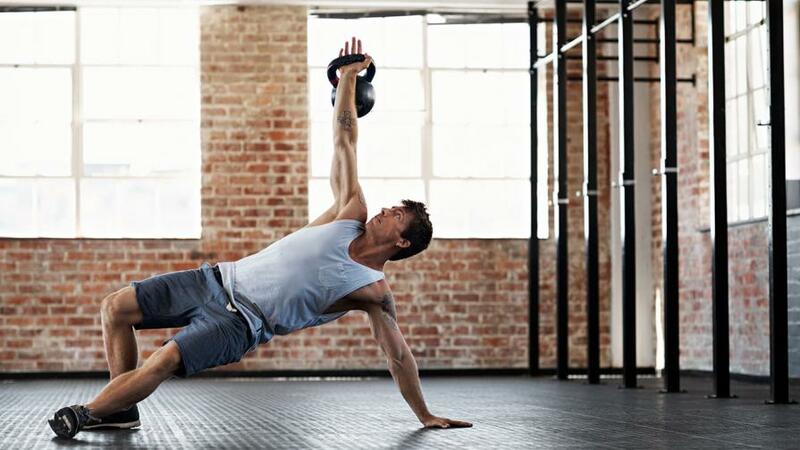 Lift the kettlebell overhead with your left arm while keeping your eyes fixed on the equipment. Rotate the arm till the kettlebell is lying against your forearm and the entire arm is placed comfortably on the shoulder joint. Bend the left leg till it is 90 degrees to the floor and stretch the right arm till it is at 45 degrees to the floor. Grip the kettlebell firmly by the horn and sit up following the line of your left arm. Next, push with the heel of your left leg and move into a full hip extension. Sweep the right leg back and into a half knee position. Remove the right hand from the floor and straighten into your body. Remove eyes from the kettlebell and stare forward. Stand up slowly, steady yourself and reverse the entire movement till you are once again lying on your back. This workout will compel your clients to use all their abdominal muscles; both on the surface and muscles embedded deep within. Select a kettlebell weight that the client can easily lift over her head. To begin hold the kettlebell firmly by both hands and lift it in a straight motion above the head. Next, rotate the kettlebell first in a clockwise motion for 10 times and then in an anticlockwise motion for 10 times more. This completes one set. This workout is taught at kettlebell courses as a modified plank done while holding a kettlebell. When performed correctly, this workout has a massive impact on your abdominal muscles and the muscles on the back. The abs are specifically worked hard from preventing your hips from sagging down while you perform this exercise. To do this workout, take a high pushup position and hold the kettlebell in left hand. Raise the kettlebell to chest height while keeping the elbow close to the body. Next, twist the left shoulder and keep the ribs open while drawing the kettlebell close to the chest. Return to the high pushup position and repeat for 10 times to complete one set. Repeat the set with the other hand.